Colloid Cysts of the Third Ventricle comprise 1% of CNS tumors. These lesions are benign. However, when symptomatic, the outcome may be fatal if untreated. Complete removal will result in a cure. Colloid Cysts affect men and women with approximately equal frequency. They usually become symptomatic from the third to the sixth decade. The origin of Colloid Cysts has been debated for a long time. Various different cells have been proposed as the origin of these cysts, including the incorporation of respiratory and enteric epithelium in the normal developing Brain. Other possible cells of origin include the neuroepithelial ependymal lining of the ventricles of the Brain, or the Choroid Plexus of these ventricles. 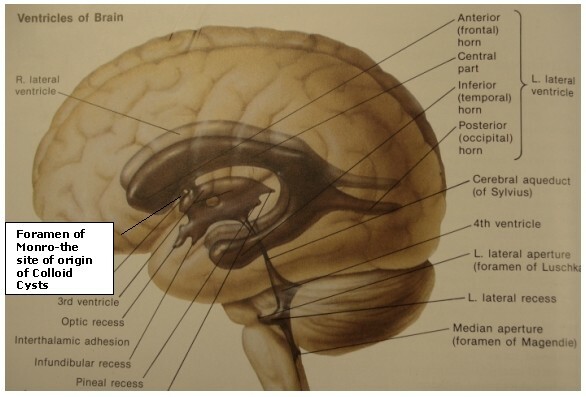 Figure 1: The Ventricular System lies entirely within the Central regions of the Brain. 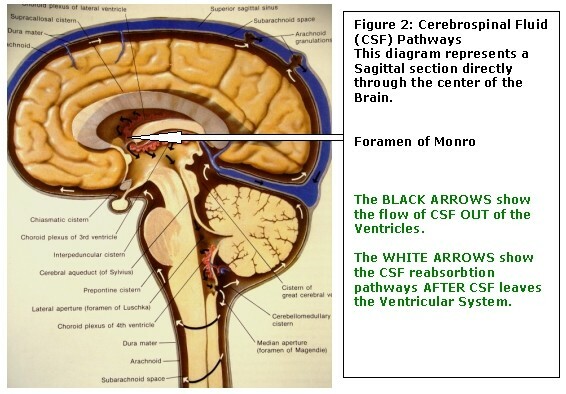 CSF is made in the two Lateral Ventricles which empties into the centrally located Third Ventricle through narrow channels - the FORAMEN of MONRO. It is here where Colloid Cysts form. The signs and symptoms produced by these lesions are primarily related to increased intracranial pressure due to Obstructive Hydrocephalus. The most frequent findings are: headache, change in mental status, nausea and vomiting, ataxia (balance difficulty), visual disturbance, emotional lability/affect change (changes in mood/emotional context), depersonalization, and increased sleepiness. As the Cyst enlarges, it intermittently obstructs the flow of Cerebrospinal Fluid (CSF - which is manufactured by the Choroid Plexus within the Ventricles of the Brain) at the level of the Foramen of Monro (a vital interconnecting pathway within the Brain's ventricular cavities). With continued growth, the obstruction becomes complete. This is a true Neurosurgical emergency demanding surgical treatment, lest death occur quickly. Colloid Cysts may also cause symptoms by pressure on adjacent structures, which results in symptoms such as disturbances in memory, emotion, and personality. CT and MRI scans form the basis for diagnosing Colloid Cysts. They also provide information regarding the presence or absence of Hydrocephalus. These lesions appear as round or oval masses in the anterior and superior portion of the Third Ventricle of the Brain, at the level of the Foramen of Monro. 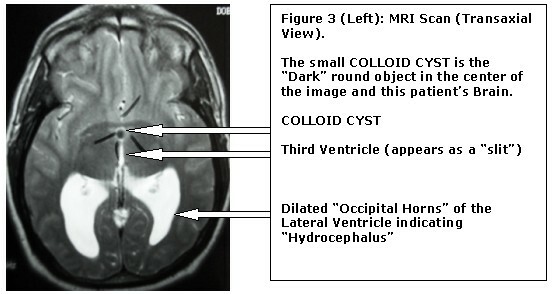 (See Figures 3, 4 & 5 for a case of Acute Obstructive Hydrocephalus resulting from a Colloid Cyst). A Colloid Cyst is one of only two medical conditions that can cause sudden death. SURGICAL REMOVAL CAN BE CURATIVE. Since there are no pathognomonic (absolute diagnostic) signs and symptoms for Colloid Cysts, the correct diagnosis and treatment depend on a physician's strong clinical sense of suspicion, which derives from the careful integration of history, neurological examination, and neuroimaging studies. Not all patients, in whom a Colloid Cyst is discovered, require immediate surgical intervention. Observation, without surgical treatment, may be an option in the patient who does not have Hydrocephalus and whose symptoms cannot be attributed to the lesion. If a patient decides not to have this lesion removed there must be complete patient compliance, ready access to Neurosurgical attention, and the ability to deal with the knowledge and implications of the lesion's existence. Nevertheless, in our opinion, A DECISION NOT TO HAVE THIS LESION REMOVED IS A FLIRTATION WITH DEATH. Patients with elevated intracranial pressure and Hydrocephalus will require urgent surgical therapy. Patients exhibiting acute deterioration, often require immediate stabilization with a Ventriculostomy (an operation to place a small tube into one of the Brain's Lateral Ventricles), to relieve the pressure from the Hydrocephalus. Endoscopic removal of the Colloid Cyst has the benefits of potentially being a less invasive procedure and shorter operative time. The Endoscope is inserted through a small opening in the Skull and is then advanced through the Brain into the Ventricular system. Once the Endoscope is maneuvered into position the Neurosurgeon is able to place small instruments through the Endoscope allowing for aspiration of the contents followed by removal of the cyst. Figure 6: Operative Photo. Drs. 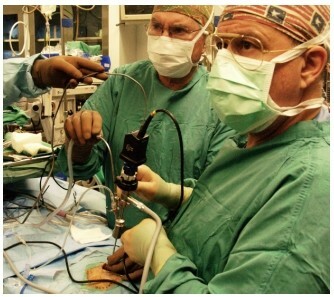 Lazar & Bland performing ENDOSCOPIC Intracranial Surgery. The Endoscope, which has a tiny camera attached to it, is being held by Dr. Bland. Dr. Lazar is performing the operation by manipulating micro-surgical instruments inserted through the Endoscope. Both surgeons are watching a television monitor which displays the image transmitted from the Endoscope's camera. The Transcortical and Transcallosal approaches involve performing a small Craniotomy (an opening of the Skull to gain access to the Brain.) These two approaches differ by virtue of which Brain structures are crossed to remove the cyst. Essentially, both of these approaches have the advantage that allow the surgeon direct access to the Colloid Cyst. The disadvantage is that the procedure is more invasive and may require a little longer operative time, compared with the Endoscopic technique. Figure 7 A (Top Left): Operative Photo during a Right Transventricular approach to remove a Colloid Cyst. This is a view of the interior of the Ventricle. The Septum Pellucidum (Quadrangular Arrow) is bulging because of the obstructed Foramen of Monro. The Choroid Plexus (Horizontal Arrow) leads to the Foramen of Monro (Curved Arrow). Figure 7B (Top Right): The Choroid Plexus has been coagulated in order to permit visualization and access to the Foramen of Monro which is filled with tumor (Curved Arrow). Figure 7C (Bottom Left): The Colloid Cyst (Arrows) is exposed and isolated within the Foramen of Monro prior to removal. Stereotactic approaches can be used for aspiration of the Colloid Cyst. This involves stereotactically placing a needle into the Cyst, to remove the fluid. Once the fluid is removed the size of the Cyst decreases and the pressure on the adjacent structures decreases. This option is usually not advocated because of a high risk of refilling of the Cyst with fluid, as well as the risk for spillage of the contents of the Cyst which can cause a sterile (non-infectious), inflammatory ventriculitis. A Ventricular Shunt is a CSF diversion system. The "Shunt" is made of Silastic tubing and incorporates a one-way flow valve mechanism that allows CSF (which is under high pressure within the Ventricular system) to be diverted to the abdominal cavity from where it is reabsorbed back into the body's fluid management systems. This is an alternative method for managing the Hydrocephalus that occurs in patients with a Colloid Cyst although complete removal of the Colloid Cyst usually obviates the need for a Shunt to be placed. However, some patients, even with complete removal of the Cyst, may still require a Ventricular Shunt in the case of persistent, symptomatic Hydrocephalus. There are unusual circumstances where a less invasive procedure may be required such as in those few patients, who are in very poor medical condition and are at high risk for an operation to remove the Colloid Cyst. In these instances, the patient could be treated with only "shunting" of the obstructed ventricles, to control the increased intracranial pressure related to the Hydrocephalus. In this situation the patient becomes entirely reliant upon the continued functioning of the shunt device (a condition known as "Shunt Dependent"). In the event of a "Shunt Failure" the patient may become catastrophically ill requiring emergency Neurosurgical intervention.